I’ve been meaning to finish this little quilt for too long…it took me all of 2 hours to get it finished, after 7 long months of thinking about finishing it! I quilted this one with a large-ish meandering/stippling pattern…I wanted to do some fancy straight line but I went with my old stand-by in the end. It works well for boy-ish quilts. The backing is this beautiful green print. The tutorial for this quilt can be found here. 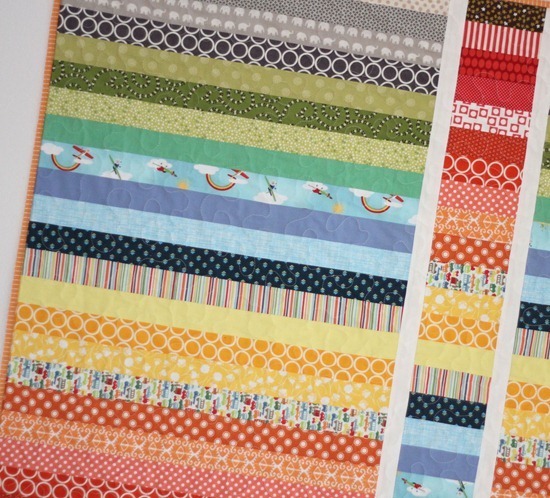 My friend Auntie Pami is giving away a copy of Modern Quilts for the Blogging Universe…go here! The quilt is lovely and the chair too. It sounds like it will be beautiful when it's finished. th quilt is so cute and fun! bet it would look great in a jelly roll too. the chair kind of looks like ethan allen. Lovin the book and chair….headed over to Anti's now! I like that quilt!! That is so colorful and a pattern that even I might try. Lovely. Looks great! That backing is beautiful! I've been looking at that pattern for awhile and this might just push me to do it. Where did you get that adorable airplane fabric with the clouds and rainbows? The quilt is terrific! 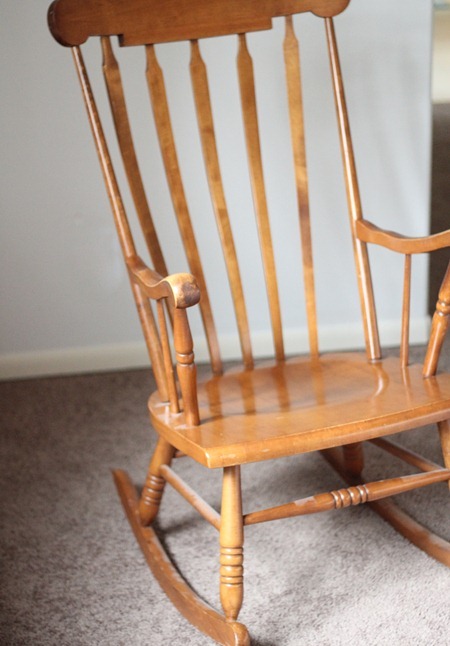 Well done…..please post a picture of the chair when it's finished! Thanks…. 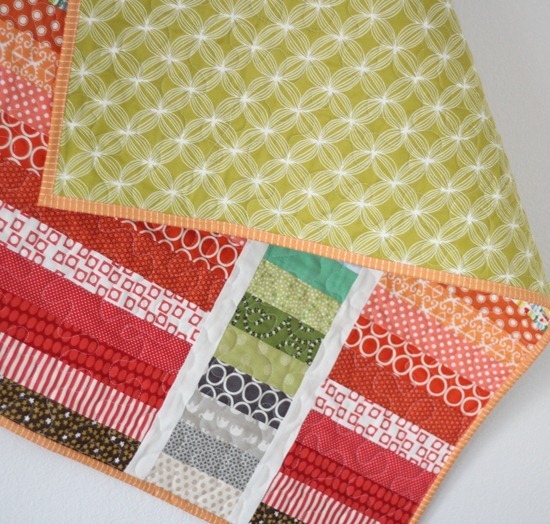 I used your tut to make a quilt for a new baby in our family last summer….it turned out awesome! 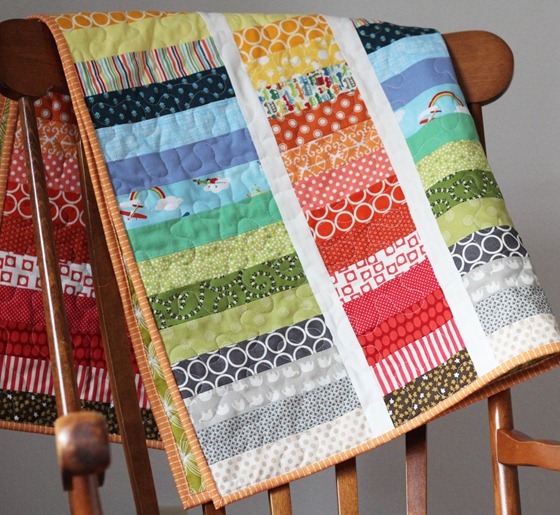 Love the bright colors of this quilt. The chair is going to be super cute. It's fun to find bargains like that and refurbish or repurpose. Fab finish! I've had that pattern bookmarked, it's great. Gorgeous chair too, my husband got me a rocking chair and it's so comfortable. Enjoy! I love seeing this finished! I pinned your quilt top and tutorial a while back and just love it. What a sweet quilt! Isn't it funny how things we have put off for ages can turn out to be so easy? Thanks for the inspiration. Pretty quilt and cute chair! Awesome $10 find! Hope you post an 'after paint' picture. My folks have the same rocker! Have had it since before I was born, actually–they hold up very well. Can't wait to see it in its new color! Very cute quilt! Can't wait to see the chair makeover! You know it's not only that you have great sewing skills, but you have such a great eye for choosing fabric! It's funny that you think of stippling/meandering as taking the easy way out. I'm TERRIFIED to do any stippling! I never know where to go and I get these wonky points and horns in my stippling. Congratulations on a lovely finish and a UFO laid to rest so early in the New Year! I love the striped binding! Absolutely beautiful – and I love the meandering – perfect! When I've finished quilting them, I'll share the strip and flip quilts (or inspired by them) that I'm making for the (our) local Children's Hospital. Yours looks grand! Ooooh! I love that. I have a couple of Jelly Rolls that I have been afraid to unwrap and this looks like a perfect and quick way to put them to use. I might have the matching rocking chair to yours. Mine is a Nickels and Stone, which is a pretty pricey brand. Love it, got it at an estate sale. Can't wait to see yours painted, maybe I will get brave and paint mine too. I used a rocking chair exactly like that one for my babies – finally got rid of it after 30+ years because I ended up with more than enough furniture. Enjoy. And I love the quilt! I laughed when I saw your Goodwill chair. I got one exactly like it last year for $10 at Goodwill, too! I love it and look forward to seeing yours painted as mine is still varnished wood. I shake my head in amazement whenever I take out a UFO that I've been unable to finish and find it works up in no time at all. I guess we all do that! Congrats on getting yours done. It's pretty. Love the chair! What a bargain. What a gorgeous quilt – I love the white borders, they break up the lines just enough for it all to make your eyes go funny in a good way! Do drop in at Harvest Lane Cottage! everytime I see a new picture pop up in my sidebar I'm thinking, no she can't have finished another quilt! How do you do that? And I love this one too! Thank you also for the machine binding tutorial, I will defintely try it! OK, Allison, I'm onto you! I saw it right over there by Camille's new one! Awesome! Growing Up Modern looks absolutely wonderful! Way to go. Question: When you bind in gray, what color do you stitch in. I've been hand binding my quilts, but I think I'm going to give machine binding a go. I have a white quilt I'm binding in gray. Thread color white? Better to show up on back than on front? Saw this Flip & Stitch quilt last year, and had to make it. Sold it to a friend & it went to a new baby in England!! Plan to make a couple more. So Cute!! Thanks. Beautiful quilt, love the colours! That chair brings back such wonderful memories for me. It looks exactly like the one my mom used to rock me and my brother in when we were young. She kept it and it was always meant to go to me when I had my babies but sadly it was damaged in shipping when they moved. I love this pattern. I also want to learn to meander FMQ all over exactly like you did! Do you have any pointers? Thank you for sharing this quilt. I absolutely love it!